Steven (Chicagoland, United States) on 21 June 2012 in Architecture and Portfolio. 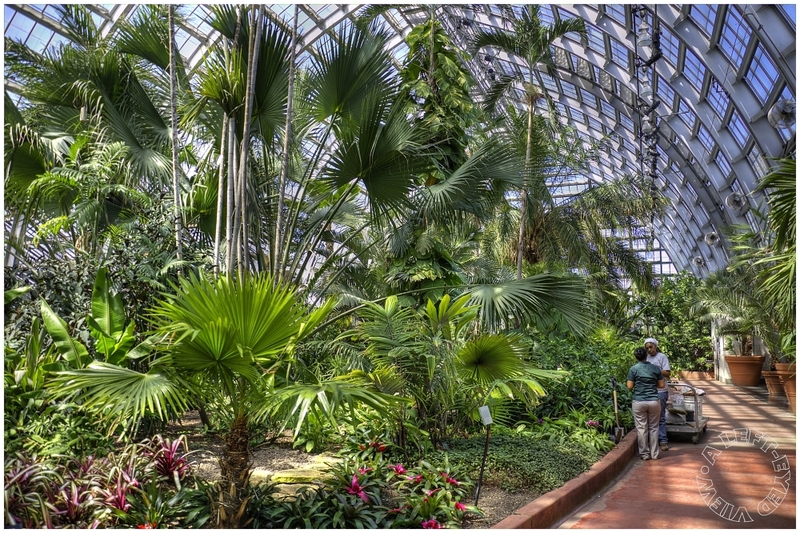 After an extensive renovation in 2003, the Palm House was re-envisioned as an idealized tropical landscape. Taking advantage of the size and 60 foot high roof of this spectacular house, the planting design intersperses a large variety of tropical plants with graceful towering palms. Steven, if I am correct, it's your special day today my friend. Have a fantastic celebration and I here wish you the most wonderful year ahead and the very best of health. Thank you very much for your visit. That makes me pleasure. Excellent point of view, Steven - reminds me of some of those Biosphere projects! beautiful frame in this angle . Very beautiful . A superb composition . A fine shot of this impressive collection, and I like the human element for scale. An impressive place with those high ceilings. Beautiful trees. Great frame putting the scene into perspective ~ a beautiful lush place! Wonderful photo! Quel bel espace .... Jolie lumière. They are growing well in the palmhouse, absolutely stunning examples.. (and shot). Beautiful shot and framing! nice capture! I bet the weather is always perfect there. Lovely. Beautiful. You really get a sense of how big these palms are by comparing to the people. I love all the varieties. That really is an extraordinary place. Terrific shot, Steven. The palette of greens and other colors is simply magnificent. Specially when it is accompanied with such an excellent detail. Great conservatory there indeed and a great beautifully framed shot as well. Those two people are a vital element for the sense of scale !